Deidre & JG are joined this week by a 3rd generation CEO to discuss how to make a family business work. Deidre and JG were thrilled to be joined in the GutwiZdom studios by Steve Geismar, CEO of PACOA, and 3rd generation leader of this hugely successful family-owned business. Steve provides wiZdoms on leading a business as well as the challenges and advantages of family businesses. What is PACOA? The name stands for Paint Applicator Corporation of America, and they are the leading wholesale distributor of paint, hardware, lumber, janitorial, and building supplies serving independent retail dealers throughout the New York Tri-State area. Back in 1969, Teddy Geismar and his son Herb were selling paint rollers and roller frames to local paint, hardware and lumber stores in the New York market. They had an assembly line in Herb's basement, with Herb and his family assembling paint roller frames manually. Teddy and Herb then delivered these from the trunk of their cars. Today, PACOA sells almost 15,000 products out of a 92,000 sq. ft. distribution center, employing 120+ employees, and operating a fleet of trucks. To be a business owner in a family owned business, you need passion, vision, and more hard work than you ever imagined. Everyone has different views of how the business should be run. Steve’s agreement with his father was whoever works the hardest and is most involved gets to make the decisions. You have to be open to changing the way things are currently done. You’re not going to survive if you’re not open to change. It’s so important to hire people that fit your culture and are in the right seats. Use assessments to determine if a new hire is right for you. Be open to feedback from your team. Ask, “how am I doing?” Also, be aware that communication styles are different between generations. Find your “entourage” to be your mentors, go to for advice, brainstorm ideas, and help you learn and grow. 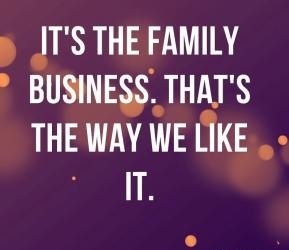 LISTENERS: DO YOU HAVE EXPERIENCE WORKING FOR A FAMILY OWNED BUSINESS? Send us your answer. Either leave us a voicemail at 1-646-653-9278 or send us an email. We may talk about it - or we may even talk with YOU - on the air!